KUALA LUMPUR, 10 JUNE 2010- Universiti Kebangsaan Malaysia in conjunction with its 40th anniversary tonight honours journalists who have covered its various activities and development thereby helping to build up its image during its 40 years of existence. 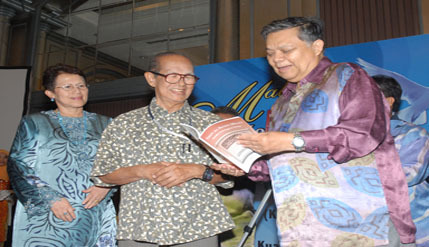 The top award of Anugerah Tokoh Wartawan Terbilang UKM 2010 was conferred on retired Bernama journalist, Datuk Seri Azman Ujang at the Malam Mesra Media UKM 2010. Datuk Seri Azman Ujang, 59, was a journalist for 30 years, all of which with Bernama. The award is given in recognition of his contribution to journalism and his vast writing experience, administration while also well received by his collegues in addition to his ties with UKM and efforts in promoting UKM. He is a member of Advisory Board for the Faculty of Social Science and Humanities and the School of Media and Communication Studies, UKM. Besides writing in the media, Datuk Seri Azman also has vast experience as a journalist in the print and electronic media as well as the new media holding various positions as editor, chief editor and general manager. He started his career as a cadet reporter in August 1971 and climbed step by step to the top when he was appointed Bernama’s Chief Editor in 2004. On 1 Mac, 2007 he was promoted to General Manager as the CEO of Bernama. Azman was also the first recipient of Anugerah Tokoh Wartawan Sarawak in 2005. He has covered numerous overseas assignments especially visits by the Prime Minister overseas and has apperared on tv forums and talk shows besides giving lectures on media and its role in nation building to government officers. In conjunction with the 200 years anniversary of the Malaysian Police Force this year, Azman was given the Friend of Police award for his contribution in helping to foster closer relationship between the police, media and society. This year UKM also introduces Journalism Awards to show its appreciation of the local journalists who have written articles on various developments, news, research as well as achievements of the university. The first prize of RM3,000 for the Journalist’s Award was won by Norliza Abdullah (Berita Harian) for her article on research being carried out by UKM’s researchers on Lembah Bujang titled ‘Lembah Bujang Kaya Sejarah’ (Lembah Bujang Rich in History). The second prize of RM2,000 goes to Shanika Abdullatib (Kosmo) for her article – Si Penunggu Gua (The Cave’s Caretaker) while the third prize of RM1,000 goes to Kosmo writer Yeo Li Shian for her article titled: Buat Imbasan Awal (Go for early scanning). Eight other journalists were given consolation prizes of RM500 each. They are Saidatul Mahiran Rosli (Utusan Malaysia) – Kongsi Kereta: Antara Impian dan Realiti: Kahirunnisa Sulaiman (Utusan Malaysia) – Memanfaat Kajian Serangga; Shanika Abdullatib (Kosmo) Kristal Yang Menyakitkan; Mohd Azis Ngah (Berita Minggu) – Mat Rempit Kepala Angin; Bazir Zahrom (Berita Harian) – Kuasa Mikro Sel Fuel; Maria J Dass (The Sun) – Ignore Global Warming At Your Own Peril; Suzanna Pillay (New Straits Times) – Inside The Emergency Rooms and Revathi Murugappan (The Star) – House Call Nurses. Chairman of the UKM Bard of Directors, Tan Sri Datuk Paduka Mazlan Ahmad bestowed the Tokoh Wartawan Terbilang UKM 2010 on Datuk Seri Azman. He also launched a book by Tan Sri Mazlan Nordin, a resident writer entitled Tokoh dan Wartawan Melayu: Penebus Peminggiran Melayu. Vice Chancellor, Prof Tan Sri Sharifah Hapsah Syed Hassan Shahabuddin, gave away the prizes to the winners of the journalism awards. Group Editor of Berita Harian, Datuk Mior Kamarul Shahid Kamarul Baid, Deputy Group Editor-in-Chief, Utusan Malaysia, Mr Othman Mohamad and Chairman and Chief Executive Officer of Malaysian Press Institute, Datuk Chamil Wariya were among 150 journalists who attended the night. While from UKM, Deputy Vice Chancellor, Prof Dato’ Mohamad Abdul Razak, The Registrar, Mr Aziz Othman, The Bursar, Haji Abdul Rashid Mohamad Fathil, members of the Senate and Division Heads were among those who attended.